Well, more accurately, I've been craving solitude in nature. After reading "Wild" last year, I've been fantasizing about running away on an epic toe-nail dropping, armpit hair growing solo trek through the wilderness in search of my inner Earth Mother/Goddess/She-Ra (Princess of Power). It's not about running away so much as trying to run into myself. Anyone else with me here? Anyone? Anyone? Is this thing on? In York, whenever I wanted to be away from cars and people, I visited the farm, which always felt well removed from all civilization, even if it was only minutes from a Walmart. Northern Virginia never feels far removed from anywhere. No matter where you go, you'll always finding yourself stumbling over a subdivision or tripping over a strip mall. A Starbucks around every corner. I've been wanting to feel away, away. To be swallowed by a forest, travailing narrow dirt paths -- like those hikes my dad used to take us on as children (we called them death marches at the time ... ahh ... hindsight) or the long walks I used to take that summer I spent in Duluth -- finding endless trails through endless trees where it felt like there were no other people in the world. Just me and the unraveling paths with peeks of Lake Superior. And bears. There were probably bears. I didn't think about them too much though. Strangely enough, this place is covered in trails. Asphalt pathways for running and biking and stroller pushing. They run alongside wide roadways and tall fences past neat shrubbery and tidy trees. And it's all very nice and clean and well appointed. But ... but ... but. Today I took Jovie to a park near our house I'd driven by a few times. I was saddened to see the standard black asphalt path leading into the yellowing woods. But as we walked, the asphalt gave way to gravel and the gravel gave way to dirt. Then dirt rippled by tree roots and rocks. I kept choosing narrower and narrower paths to go down, hoping to find what? I don't know. Absolute quiet? Absolute stillness? The divine? It wasn't buried in these woods – so close to the airport you can see the landing gear of the planes overhead and glimpses of grills on the decks of houses surrounding this (kind of) wild place. Choosing the rockiest paths did not lead to grand vistas or untouched wildernesses, but it did make us slow down. To tread carefully over unearthed rocks and roots. To scrape by thorny vines and grabbing sticks. Here it was that I had a thought about stillness, about slowing down. Maybe it didn't matter much where the path led, only that it forced me to take my time. To stop and check for rocks in shoes and the best way to cross the creek. 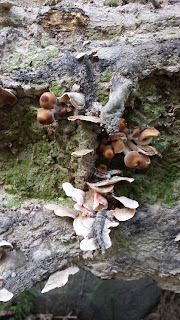 If we had been biking or running or even walking at a faster pace, we might have missed the cardinals on the creek bank and the turtle on the branch and the salmon-colored mushrooms growing on the toppled tree. 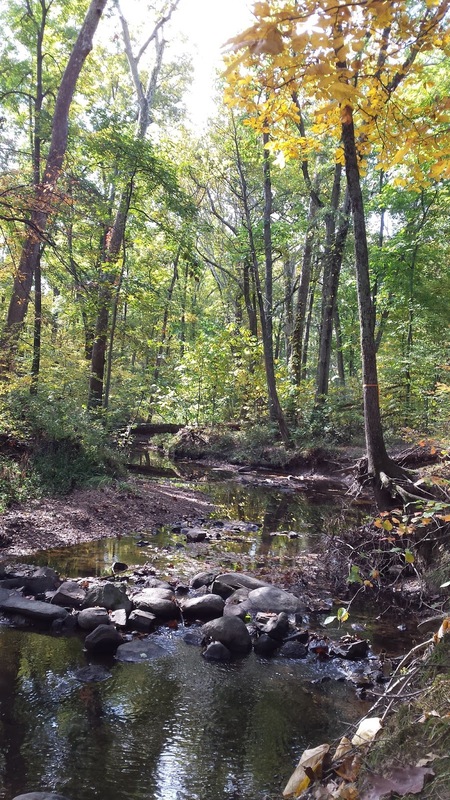 The green spaces here and their warren of asphalt paths might ease our journeys and keep our feet mud free – but I don't know, isn't the whole point of disappearing in the woods to find your way back to the earth, grime and all? Even if it is only a scrap of trees between your neighborhood and the grocery store. Can't we pretend to be even a little wild? There were no grand adventures in the woods today. 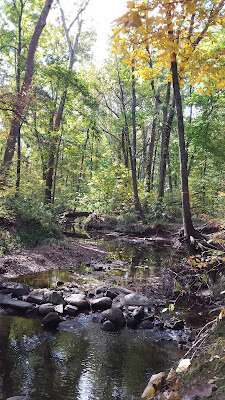 It was sun dappled and beautiful -- littered in gold leaves and smelling sweetly of the changing seasons. 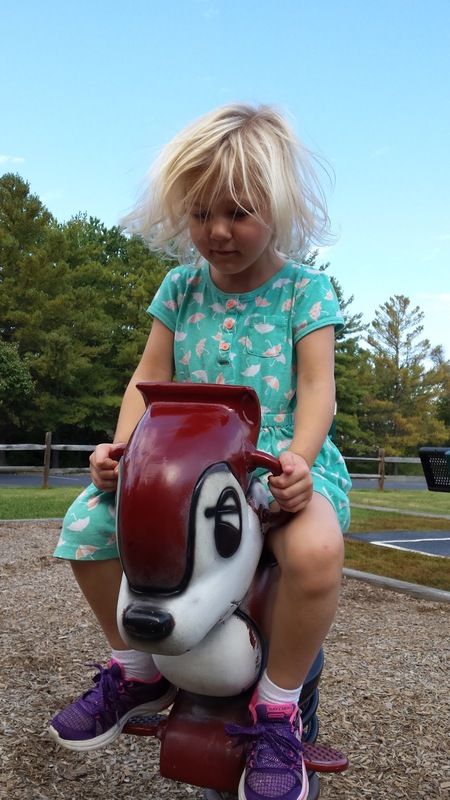 We took the path less traveled and it took us to tennis courts and a playground where Jovie could ride a giant chipmunk and climb a plastic rock wall like the pioneer girl she was born to be. It wasn't so depressing actually. The woods seemed to giggle along with me at the absurdity of it all. Guess I'll be keeping those toe nails for now. They grow chipmunks big around here.